Want to save on those costly energy bills? Adding any window covering to a window will reduce energy consumption but some window coverings are better than others at saving energy. 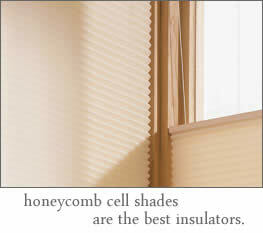 The best insulators and energy savers are honeycomb cell shades. They are designed with a unique honeycomb shape that uses the air between each honeycomb to insulate your windows. Honeycomb shades block heat entering your home during the summer months as well as the cold during the winter. Don't like the look of honeycomb shades? The Comfortex Fusion Shade is a roman shade with a honeycomb shade insulator hidden behind and is a great energy efficient blind. Fusion shades offer a more attractive roman shade with the insulating benefits of a honeycomb shade. Try our energy savings calculator to estimate how much money you might save. Enter the size of your home and will will show you an estimate of how much you can save with each of our energy efficient shades or blinds.